Any USC student or faculty can join a choir for credit or as an extracurricular activity. Regardless of your background or level of experience, we have a choir for you! To join a choir, please click here to sign up for Voice Placements! Voice placements will take place on August 22-23. Singers interested in singing with Chamber Singers or Concert Choir must sign-up for a voice placement. Have questions? Email uschoral@usc.edu. Voice Placements for choirs are quick (10 minutes) and simple. A conductor will help guide you through a simple process and discuss any previous singing experience you may have. You don’t need to prepare anything! The USC Thornton Chamber Singers have been hailed as a model of excellence since their inception in 1939. In 2016 they performed Bach’s Wachet Auf with Jeffrey Kahane and the Los Angeles Chamber Orchestra, an all-English program with Simon Carrington, and Gubaidulina’s fiendishly difficult Sonnengesang with cellist David Geringas for the Piatigorsky International Cello Festival. Recipients of the 2015 American Prize in Choral Music, the Chamber Singers have recently performed under the direction of Dr. Jo-Michael Scheibe for American Choral Directors Association conferences, including the 2015 National Conferencein Salt Lake City, UT and the 2014 Western Division Conferencein Santa Barbara, CA. Also in 2014, the Chamber Singers performed in Beijing at the XII International Festival of Choral Music, and were one of twenty-five choirs to perform at the X World Symposium on Choral Music in Seoul. Other notable past performances include Britten’s War Requiem with conductor James Conlon at Walt Disney and Segerstrom Concert Halls, Mozart’s Requiem with conductor Helmuth Rilling and the Los Angeles Chamber Orchestra, and J. S. Bach’s Mass in H moll. In addition to their extensive international performances, they have performed locally with artists such as Sir Elton John, Barry Manilow, and The Rolling Stones. The Chamber Singers recently released of their new Christmas album, “Brightest and Best,” which is available through the USC Bookstore. The USC Thornton Concert Choir is a 50-60 mixed voice choir under the direction of Dr. Cristian Grases. This ensemble performs a diverse repertoire of music from all over the world, including all musical periods. For their most recent accolade, the USC Thornton Concert Choir was selected for and performed at the 2015 National Conference of the National Collegiate Choral Organization (NCCO) in Portland, OR. They often combine with Chamber Singers for performances of larger works. The members of Apollo are a diverse group ranging from freshman to graduate students, faculty and staff. Enjoy camaraderie and striving for excellence in performance of music from classical to contemporary a cappella bass-clef music. The Oriana Choir welcomes any person at USC to participate in this treble ensemble. Performances include early and modern choral music from around the world. 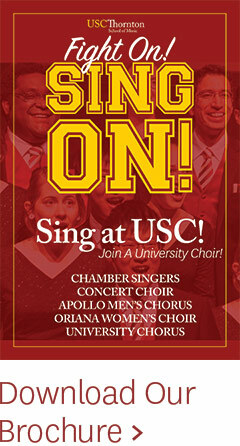 The University Chorus is open to any USC student, faculty, or staff member as well as the larger university community. It provides an opportunity for members of the community to sing in a mixed chorus and perform outstanding choral music.